This studio condo is a well-decorated, newly refurbished 2nd floor (top floor) unit. It is in the most PRIVATE area of the small (80 units) complex. The FLOOR-PLAN is better than the 1 BR units at Kona Shores--this Studio has an entry into a vinyl-floored hall, a separate room kitchen on the right and a large bathroom with double sinks on the left. The living area is carpeted, having two areas, a Dining area and an offset space for the king-size bed. A pleasant, private deck overlooks landscaping of two properties; it is far from any building, and (in Winter) has a view of Mt. Hualalai. This unit is in the northwest corner of the facility, furthest from busy Alii Dr. and nearest the ocean. The ocean-side POOL is perhaps the best for size and VIEW on Alii Dr. This livable unit has new kitchen and bathroom flooring, newer cabinets, carpet, vertical blinds, and a modern gas stove. Lighting and fixtures were upgraded in 2015. The sleeping area is offset from the dining area and includes a king-size bed, 2 chests of drawers and wall reading lights above the bed. It has a wall air conditioner, more than adequate for the space. The Dining area has a round glass-top table and four chairs; two padded chairs--one a recliner; Cable TV, a wall mount flat-screen TV with extension and rotation, DVD, and VCR; and two bar stools at the pass-through to the fully equipped kitchen. The bathroom is sizable and has DOUBLE sinks, two Large wall mirrors with vanity lights; and a NEW tub shower. The very private deck looks out onto the tops of golden-fruited palms, complete with green day geckos and a variety of birds. In Winter the view of Mt. Hualalai is particularly clear. Lanai furniture includes a love seat, coffee table, and one padded chair. The ASSIGNED parking spot is nearby, on the way to the Pool, which is right on the ocean with great views of sunsets, ocean, and Kailua Pier. It is a wonderful place to relax and read. Also, the resident's BBQ area, including tables in a covered area, and the grass recreation area are not far from the pool. The commercial type laundry is on the way to the parking lot. The Condo is at Kona Shores which is 1 mile south of Kailua village (immediately south of Sea Village) on the ocean-side of Alii Dr. The address is 75-6008 Alii Dr., Kailua-Kona, HI 96740 . 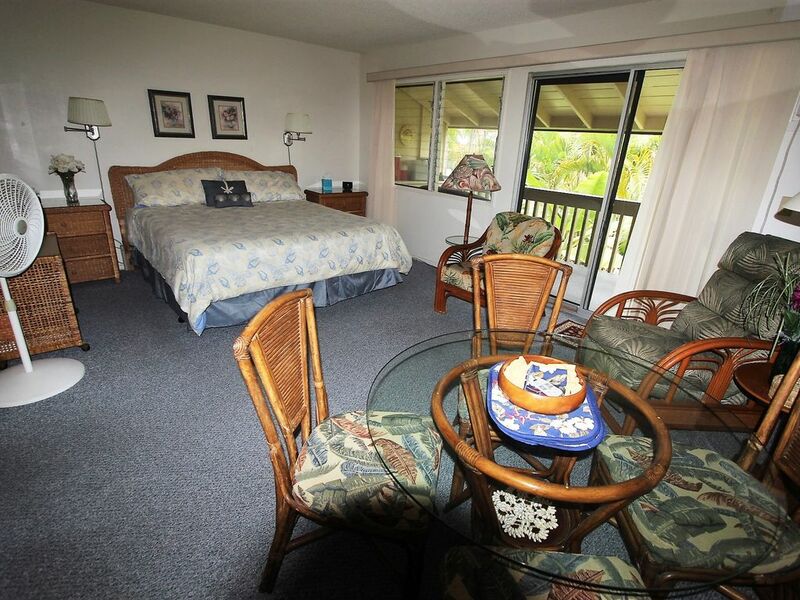 We also have a Tropical Garden 1 BR corner unit very nearby at Kona Shores (VRBO #9673) if you would like a larger unit. Since 1985 we had been coming to Kona Shores annually. In 1994 we decided to buy in this complex. We searched only the North wing as it was the most private area and had good garden views from the decks with lots of landscaping (and a parking lot) between the unit and the buildings of the property north of us--quite private and quiet! Being almost furthest West also separated us from the noise of busy Alii Dr. Also, we liked the floor plan--much better than the "1 BR" units at Kona Shores (where you enter into the bedroom, and the kitchen and living room are one and the same). The Studios have an entry Hall, with a separate room kitchen on the right and a sizable bathroom on the left. The living area has the bed area offset so you don't notice it when you enter from the front door--and get to look through the dining area to the glass slider door of the deck and out to the tops of Golden-fruited Palms. Long Counter with two sinks and Vanity Mirror for full length. Shower/tub combined. Views from Pool and Path to Ocean are extraordinary. Lounge and look at waves going over a lava point right in front of you. Watch great sunsets. Look right over Kailua Bay to Kailua Pier. assigned parking spot--no hunting for a vacant one. Dining area contains a glass topped table and 4 chairs. It has a pass-through to the kitchen, which is a separate room. Books include several guides to Birds, Trees and Plants of Hawaii. A few pocket books are supplemented by a shelf of them at the Mail area. Very private 'lanai' with garden view. In the Winter you see Mt. Hualalai behind Kailua-Kona. Right on the ocean. Pool is large enough to swim laps. It is seldom busy in this smaller complex. The unit was super clean, the cupboards well stocked. Notes posted here and there helped ensure that we were doing things right. Because of my foot problem, I didn't think I would be able to remove my shoes as requested. But I gave it a try and the soft flooring throughout was a pleasant surprise. I could remove my shoes and not suffer adverse consequences. There were very realistic looking flowers throughout the unit, giving it a homey feeling. For a studio condo it was roomier than expected. We spent a lot of time outside on the lanai and made fairly good use of the pool. Designated parking space close to our building was a definite plus. I had hoped that in an oceanfront condo we would be able to see the ocean, but all we had was a peek-a-boo glimpse from the lanai. The neighbours were quiet. We rarely heard them and on those occasions it was always early and not a problem. Our late booking and subsequent computer issues required more communication with the owner than what I suspect would be normal. He was always helpful and quick to respond. Overall it was an above average experience and would recommend this rental. Everything needed for a relaxing vacation, had a nice time. Only issue was the lack of hot water, manager said it was because room was so far from the water heater. Shower head heaters like the ones used in Costa Rica would help. Loved the location especially the view of Ali'i Dr from the pool area. Had a wonderful family night using bbq dining area and pool. Laundry is close to unit (clothes in dryer means pool time!). Loved having a full kitchen so I could cook in. Nice to have basic cooking items on site as well. Including coolers for beach picnics. All in all a great place...would definitely stay there again. Glen and Ginny were wonderful hosts who responded quickly to my request to extend my stay. The rental condos is very good and very clean, there is all that you need. Great snorkeling at many spots within 5 miles; others within 20 miles--best in HI. Good local beaches and one world class beach within 25 miles. Small town atmosphere with reasonable restaurants and shops. Picturesque walk along main drive, many areas open to ocean. Unspoiled! $200 reservation & Security Deposit should not be subtracted from Final Full Payment; returned after visit Full payment is due approximately 30 days (1 month) in advance of arrival date. Ironman dates are High-Season Keys will either be: 1) accessed in Lock-Box at Unit--Upon departure RETURN KEYS to Lock-Box; or 2) Mailed directly to your home address--After departure please mail keys as soon as possible to Owner. Cancellation: Deposit will not be returned if cancellation is within 60 days of arrival date. Rental payment will not be returned if cancellation is within 30 days of arrival date.